Sometimes, when men lose weight, they discover they have a build-up of skin that lacks its natural elasticity. In addition to excess skin, there may be an accumulation of fat tissue, as a result of daily routines, or even uncompromising genetics. It can hide the effort you have put in to regain your masculine form, and would seem that this undesired development can’t be removed with proper exercise and diet, alone. With a male tummy tuck, that overstretched skin and excess fat is removed, giving you a little extra help to expose your abdominal muscles, for a more sculpted appearance. 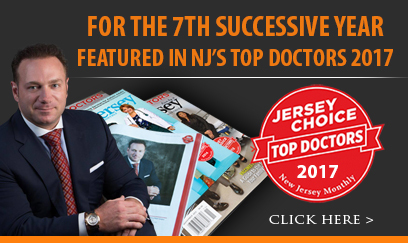 Dr. Racanelli aims to give you the best male tummy tuck New Jersey can provide. Not too dissimilar to an abdominoplasty procedure for women, it involves an incision in the lower abdomen, usually below the swimsuit line, so that the scar may be strategically hidden by one’s clothing. This may vary slightly depending on your unique physique and where clothing sits on your body. Regardless, the techniques remain the same. The benefit of having Dr. Racanelli perform this procedure is that he uses an advanced technique. Instead of a “single-layer plication,” Dr. Racanelli employs a “multi-layer plication” that includes tightening the muscles and fascia in multiple layers. Many other surgeons do not use this technique, as they do not have the expertise. Additionally, Dr. Racanelli utilizes liposuction to the more affectionately titled, “love handles” as part of the male tummy tuck procedure. An added benefit of having a male tummy tuck procedure is the tightening of the abdominal wall. The result of the multi-layer technique is a flatter, more defined abdomen, giving you an accentuated looking 6-pack. Dr. Racanelli strives to administer one of the best male tummy tucks Brooklyn has to offer. Every male tummy tuck procedure is customized to your body and your specific requirements. Therefore, the recovery period will depend on such factors as, the length of the incisions, and the extent of correction desired, along with one’s age and general health and fitness. After your male tummy tuck surgery, the treated areas will be wrapped in an elastic binder to help provide stability. Recovery after a male tummy tuck can differ, but generally speaking, our male tummy tuck patients should expect to take at least 2 weeks away from work. It is encouraged that you resume light activity as soon as possible to facilitate the healing process. However, you should avoid any heavy lifting or exhaustive activity for the first several weeks. Once you have scheduled a consultation, Dr. Racanelli will go over your personal goals that you’re hoping to gain from plastic surgery. It is important for you to feel good about your decision. Which is why Dr. Racanelli makes sure that you are completely informed throughout the process. From the consultation, Dr. Racanelli shall be able to determine the best options for your particular physical aspirations. Plastic surgery is very much a collaborative effort, and Dr. Racanelli seeks to deliver the best male tummy tuck New Jersey has to offer. If you’re interested in further discussing your options for physical enhancement in Brooklyn or New Jersey, you can request a consultation online. Or you are more than welcome to call the office directly at (888) 982-3309 and one of our staff members can assist you.